4 stars for this classic 1990's TV series, 3 stars for the conversion. 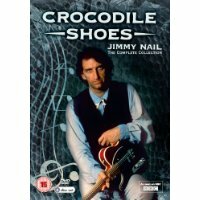 Crocodile Shoes was first shown on BBC One in 1994 and was written by the star, Jimmy Nail (Auf Wiedersehen Pet, Spender) who also had a successful music career on the back of the series. This tells the story of Geordie factory worker Jed Shepperd, played by Jimmy Nail, who operates the "magic lathe" for a living, but writes country music for a hobby. When his sister Emma (Melanie Hill - Waterloo Road, Stardust) sends copies of his demo tape to record companies in London, his talent is spotted by Ade Lynn (James Wilby - Maurice, Gosford Park). With the prospect of redundancy on the horizon, Jed is forced to make a big decision, does he leave his old life behind and try to make it big in the country music scene, or stay in Newcastle to face an uncertain future?